One thing I noticed while making batches of cookie bark is that baking at a low temperature for a longer amount of time almost always results in an evenly cooked and very crisp product. Recently, I’ve been applying this to some of my miniature cookie recipes. 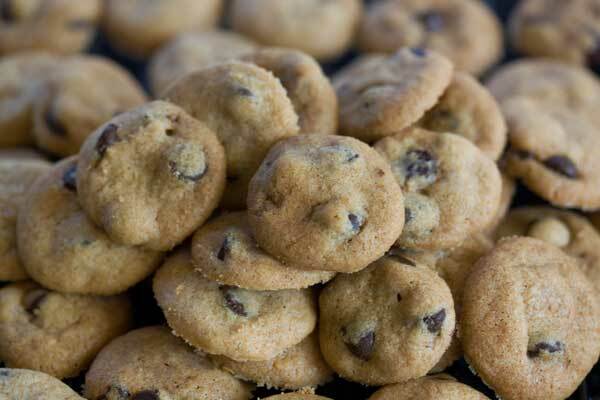 I’ve always loved teeny tiny mini chocolate chip cookies (especially the ones from Trader Joe’s), but prefer them to have a uniform crispness throughout, and for the longest time I kept getting cookies that were just too brown around the edges and not cooked enough in the center. The low temp, long bake time fixed that problem completely! These little chocolate chip cookies were baked at 300 for about 25 minutes. They browned evenly, had a light and crunchy texture and spread into nice circles (well, most of them). This particular dough worked well, but I’m going to experiment with a few other high butter/high sugar (doughs notorious for spreading) as well. UPDATE: I love this recipe, but I’ve found a couple of other doughs that are also good for making mini chocolate chip cookies. #1. If you are okay with using shortening, try making these crunchy chocolate chip cookies using the method below (tiny drops of dough baked at 300). These are light and have a nice structure thanks to the shortening. #2. If you want an all-butter mini cookie recipe, make these crunchy cookies as minis using the 300 degree method. They’re a little harder and crunchier (as opposed to light and crunchy) and thicker. Beat the butter until creamy using an electric mixer. Beat in both sugars, and vanilla. When creamy, beat in the egg. When egg is mixed in, beat in salt and baking soda. Add flour and stir until it is almost blended in. Add the chocolate chips and stir until all flour disappears. Line two large baking sheets with regular foil. Using a 1/4 teaspoon measure, scoop up rounded spoons of dough, each with about 3 chocolate chips (you'll have what appears to be a lot of chips and a tiny bit of dough). Shape into marble size balls and arrange on baking sheets spacing about 1 1/2 inches apart. Bake one sheet at a time for 25 minutes or until cookies are evenly browned. Let cool slightly, then remove from baking sheets to finish cooling. Baking at a very slow and low temperature helps the inside and outside cook evenly, giving you a uniformly crisp texture throughout. The number of cookies is approximate. I recommend baking one sheet of 20 (or so) just to nail down the exact bake time in your oven. That’s awesome, Farah! I admire your patience because these tiny cookies take a while to shape. Thank you so much for sharing the recipe! Made 2 batches recently and finished up in a jiff! Everyone loves it! Gonna bake another batch tomorrow. Great, Nia! Glad it worked for you. And no, you can substitute chips without making any changes. This cookie recipe is the best by far! love the crunchiness! if i substitute the choc chips with butterscotch chips, do i need to change the recipe? May I know how to do in big batches? Do I double up the recipe? Glad to hear you liked the recipe! It’s one of my favorites, but I haven’t made it in a while. Sorry you had to adjust the temperature, but glad you were able to get the perfect texture by lowering to 275. Hey Anna, I followed the ingredients for this recipe as written but I doubled the vanilla and used mini Ghiradelli semi-sweet chocolate chips. I tried the first batch at the recommended 300 degrees and at about 13min I had to pull them out because they were getting way too brown. I have a convection oven so I baked the next batch at 275 and they baked a perfectly crispy crunchy cookie at 12min. This overall was a great recipe, Thank you for posting! Glad you liked them! They are one of my favorites. Made these and they were great! I don’t mix in the chocolate chips but just add 3 to each cookie before baking. Thanks for sharing. Thanks for the review, Eileen! I appreciate it. And thanks for the tip on adding coconut. Around here we just call those cookies “hard ladyfingers” so thanks for educating me on the name. The brand my store carries is called Alessi and I use the cookies for tiramisu since they soften nicely under cream. It will be a while before I can try some authentic Brooklyn bakery ones, so I too would like to have a scratch recipe. I’ll look around! Thanks for the tip. I just found your site while looking for recipes for the Italian cookies/biscuits called Savoiardi…….named after the King of Savoy. They are sold in most bakeries in Brooklyn but I have not been able to find an accurate recipe that creates the thin shell that forms on the top which is super thin and crispy. 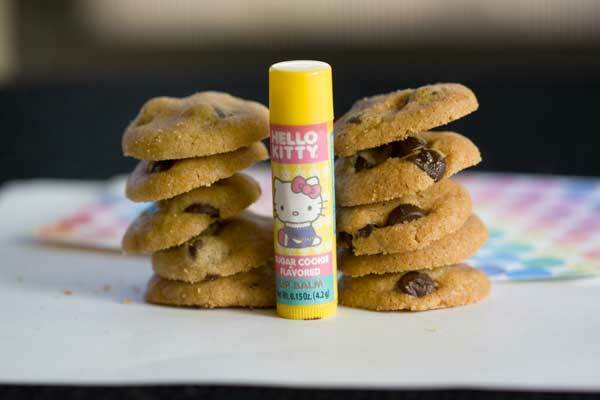 If anyone out there has ever made these I would sure love to have the recipe…..This site is amazing and I cannot wait to try those mini cookies…..bite size are the best . Cleo, yes. Any changes you make in butter or sugar will definitely change the outcome. I think the moisture from the Nutella might take away from the crispness of the cookies. However, you could probably chop up a chocolate/hazelnut candy bar and use that instead of the chips. Good luck! Soooo cute! For a variation, could I ommit the choc chip and add perhaps nutella or similar ing? These are adorable! I can’t wait to try! Our store had the Ghirardelli miniature chips around the holidays, but I haven’t seen them since. Hershey’s also makes miniature chips, but the only time I saw them was visiting the test kitchen at Hershey’s. I’m not sure where they are distributed. So the default is Nestle, which are always available. Oh, and I agree about low and slow–especially granola. But now I want to try cookies, too. Minis would be “legal” for me to snitch. 😉 Love these! Hmmm, I’ve only ever seen Nestle’s minis. OH MY!! These will look great as cake and cupcake decorations!! Thank you for all of your recipe testing. How adorable! I can’t wait to try this recipe. I just know my daughter will love these. 🙂 After searching a while for a good quality mini-chocolate chip, I have found favor for the Ghiradellli miniature semi-sweet chocolate chips. They’re hard to come across, but every once in a while I find a few bags. Those really are teeny tiny! They look store bought and I mean that in a good way. I love this idea for so many reasons! This past Christmas, my mom baked her shortbread cookies low and slow and they were the best ever. Just like letting some cookie doughs rest for a day or two in the fridge, I think there’s additional flavour and texture development that happens with the low temperature. I feel some experimenting coming on! Yes, but I never seem to have them around. I’m also having trouble finding a brand of minis that I really like. For these cookies, I used regular size Guittard extra dark chips. Would mini chocolate chips go good here?